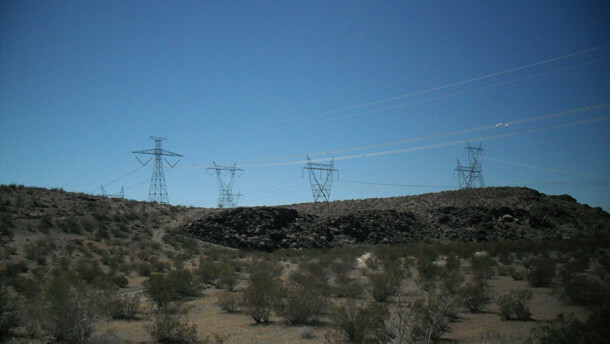 For many years I have worked in power plants that generated electricity for "the grid". "The grid" refers to the electrical distribution system that supplies electrical power to our homes and factories, sometimes from power plants more than 1000 miles away. Some of the units I worked on were as large as 750 megawatts. Some were smaller ones, like the 10 megawatt Solar One project that was the first industrial scale solar plant connected to the grid. For the last decade or so I have worked in power industry only part-time and I have lived full-time in a motor-home. I turned my attention to wandering aimlessly, living among the Saguaro cactus and the giant redwoods. Sometimes I receive all the electricity I need from my solar panels. Indeed there's a certain joy looking at the control panel and realizing you will have a full charge by 10 o'clock in the morning. This is what's known as living "off grid”. But is it really off the grid? Solar panels produce electricity which is the very essence of the electrical grid. And of course these panels can only be produced by a factory connected to the electrical grid. This is like one acorn saying that it's living off the tree. However the acorn in its essence is the tree, and it is made by the tree. Of course the mighty oak tree cannot say that it is living off forest, because it is part of the forest. Here we must understand that the forest is much more than just a collection of trees it is a complex ecosystem. So the question is, just what is the grid, and where does it start and end? To answer this it is important to understand that we can say the grid or the collective interchangeably, because the grid is many things. To get a proper understanding of anything that is a collective one must start with the smaller individual components and then work your way to the larger more complex ones. Sometimes these smaller components are a complex collective in their own right. For instance a human cell is a complex, individual part of the human body. This makes every individual human being an organized collective. And when human beings come together they make the collective we call humanity. Which in turn takes care of an even larger collective we called the grid. Which includes building it, managing it, and facilitates the assimilation of others into it. Then we could look at this situation from the other direction and define the electrical grid as that which takes care of us, the human body individually and collectively. So it is that “we” are a collective, the biological and the mechanical, a large cybernetic entity. If we look, we humans will see that there is more to the grid than just an electrical distribution system. It is telephone, television, radio, the Internet, and our transportation systems, and much more. For none of these could exist on their own. They are the organs and extremities of the collective, the “grid”. Even the plants and animals on our farms are just genetically assimilated parts that live to serve and function within the collective. There is a certain beauty in the symmetry of our cybernetic existence, with the biological and the mechanical in harmony, as one. Essentially it is the greatest work of art that has assimilated all other forms of art and their artists, but not all the beauty. So when we look, there’s more to the collective than just the harmony of biology and mechanics. For we, the collective, exists in the realm of thoughts and ideas. This drives the technology of the collective forward and gives enlightenment and comfort to its components. Some ideas like political associations or the idea of one country or another, for example had their own Genesis, and existed at one time purely for their own purpose. However many of these ideas have been assimilated into the collective and now function according to the will of the collective. Whether an individual within the collective understands this or not, is largely dependent on the will of the collective. Some ideas are manufactured within the collective such as sitcoms, soap operas, and sporting events and are often called programs, which indeed they are. From these programs we the “collective” download our morals and our hopes and dreams. Outside the collective one would find only individuality, pain, suffering, and numerous concepts and individuals that are not useful to assimilate. Some of these can be ignored, others are toxic or dangerous to the collective and should be destroyed! So from all this we can deduce that we exist in a beautiful cybernetic body and have a vast collective database. Which leads us to a daring question: Is there a collective mind, a collective consciousness a soul? And what are the ramifications of this, one way or the other? Do we mindlessly seek technological perfection, because this is the way the program evolved. Or is the collective engaged in something more significant, perhaps the eternal pursue of all that is beautiful and good, even into the supernatural realm? One might do well ponder which of these, is the way of things. History does not repeat itself but it does rhyme. Learning to track and read animal sign is a highly important skill. This lecture speaks to some of the basic concepts and ideas and provides a framework on how to learn or further hone your skills. I found this to be an excellent book! It seemed to be more about the wind than weather, but as we know, wind and weather are inseparable. The wind is often a major component that can be discussed in its own right.